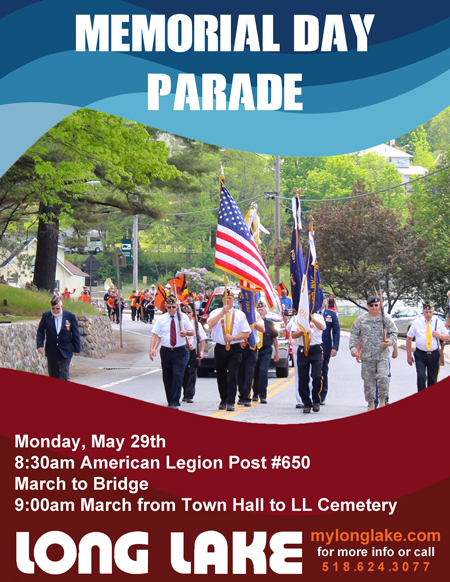 The Long Lake American Legion Post #650 will be hosting the Long Lake Memorial Day Parade on Monday, May 29 in Long Lake, NY. The parade starts at 8:30 a.m from the Long Lake Town Hall, 1204 Main Street, Long Lake, NY. The Honor Guard will march to the Long Lake Bridge to commemorate those lost at sea and then return to the Doughboy Monument and Town Hall. At 9 a.m. the parade will re-commence and go to the Long Lake Cemetery for a ceremony and speech continuing on to the Vietnam Memorial at South Hill Road and Deerland Road. The guest speaker for the Long Lake Memorial Day ceremony is CSM Christopher Reeves, Senior NCO for the 91st Military Police Battalion at Fort Drum. CSM Christopher Reeves enlisted in the Army on 17 November 1993 as a Parachute Rigger. In August 1995 he reclassified and earned the MOS 31B, Military Police. CSM Reeves military education includes the Airborne Course, Parachute Riggers Course, Basic Leaders Course, Advanced Leaders Course, Senior Leaders Course, Law Enforcement Senior Leaders Course, Hostage Negotiation Course; Antiterrorism Officer Basic and Advanced Course, IMCOM DPTMS Course, Drill Sergeants Course, First Sergeants Course, and the United States Army Sergeants Major Academy class 64. His awards and decorations include the Bronze Star Medal, Defense Meritorious Service Medal, Meritorious Service Medal 3OLC, Joint Service Commendation Medal, Army Commendation Medal 6OLC, Joint Service Achievement Medal, Army Achievement Medal 7OLC, Army Good Conduct Medal 7TH Award, Iraqi Campaign Medal with 3 Bronze Service Stars, Global War on Terrorism Service Medal, NCO Professional Development Ribbon Numeral 5, National Defense Service ribbon, Army Service Ribbon, Overseas Service Ribbon numeral 3, Kosovo Campaign Medal, NATO Medal, Meritorious Unit Commendation 1OLC, Army Superior Unit Award. 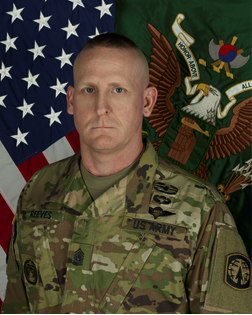 He has also been awarded the Combat Action Badge, Parachutist Badge, Rigger Badge, Drill Sergeant Identification Badge, French Parachutist Badge, German Armed Forces Efficiency Badge (Gold), Order of the Marechaussee (Bronze), CSM Reeves is a member of the Distinguished SGT Morales club and the Audie Murphy club. In the event of rain the ceremony and speech will be held at the Long Lake Town Hall, 1204 Main Street, Long Lake, NY 12847. 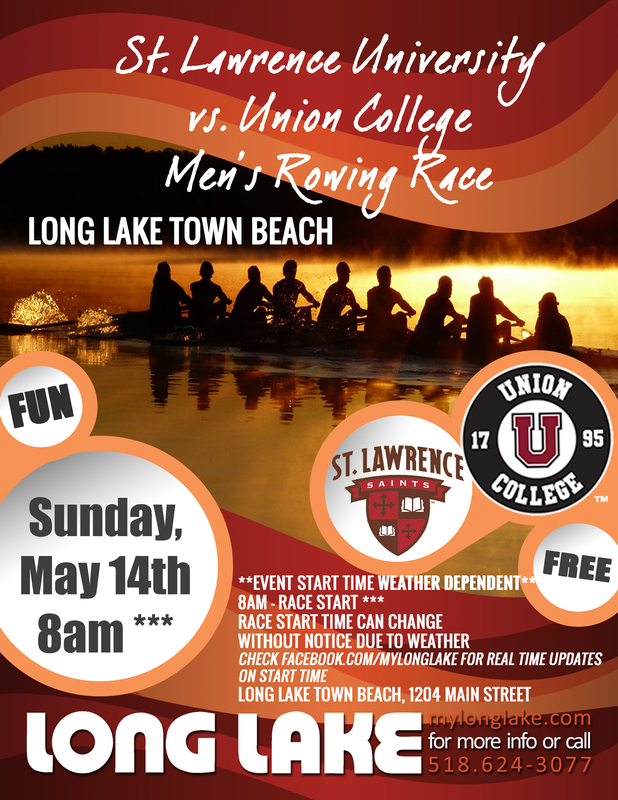 On Sunday, May 14th, 2017, Mother’s Day, the men’s rowing teams from St. Lawrence University, Canton, NY and Union College, Schenectady, NY meet for a match at the Long Lake Town Beach located at 1204 Main Street, NYS Route 30 in Long Lake, NY. The race is tentatively slated to kick off from the Long Lake Town Beach between 8 a.m. and 9 a.m. weather dependent. The race could kick off as early as 6 a.m. if needed due to weather and wind. Announcements on race kick off will be available on www.facebook.com/mylonglake and the longlakeny twitter feed @longlakeny . Please note: the start time of the race is subject to change without notice. The area between Helms Aero Service and the Town Beach Restrooms will be reserved for parking for team trailers and shells starting Friday, May 12th through Sunday, May 14th. The event is free. Parking for spectators will be along the NYS Route 30, Main Street on the Jennings Park Pond side of the road with additional spectator parking available at Long Lake Central School. Pastries and coffee will be sold on the beach by the ADK Trading Post to spectators. There is no race course or finish line set until this weekend. The coaches will assess the best location for the race and determine start and finish at that time. Teams will practice on Saturday. The race slated for Long Lake, NY came at the suggestion of St. Lawrence University sophomore, Henry Sandiford, a 2015 Long Lake Central School graduate. Henry and his coach hatched the idea hoping there would be time in the spring to host this event in Long Lake, NY. Henry contacted the Town of Long Lake’s Parks and Recreation Department to check on the viability of staging this event. The Director of Parks & Recreation, Alexandra Roalsvig, happens to be Sandiford’s aunt and an alum of Union College and jumped at the opportunity to offer the Long Lake Beach as a staging ground for this historic event. This is the first year for this race to be held on Long Lake, NY. The Long Lake, NY beach location is mid-point for the teams. Many alumni and parents from both institiutions live in the surrounding communities and school spirit for both sides will be evident.